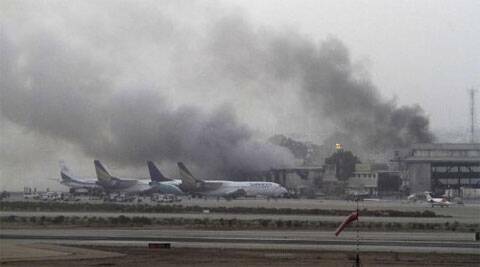 Pakistan on Friday released the sketch of an Uzbek national it claimed was the mastermind of last month’s deadly attack on Karachi airport, days after the military said he was killed in North Waziristan during an ongoing operation. Security sources last month claimed that Abu Abdul Rehman al Maani, the alleged architect of the June 8 assault on Jinnah International Airport, was killed in an airstrike during the all-out offensive against militants. He is believed to a leader of Uzbek militant group Islamic Movement of Uzbekistan, which along with the Tehrik-i-Taliban Pakistan, had claimed responsibility for the attack in Karachi. At least 10 attackers, all Uzbeks, and 26 others were killed in more than six hours of gunbattle between security forces and the militants forcing authorities to suspend air traffic for over 27 hours. Pakistan on June 15 launched Zarb-e-Azb operation to flush out local and foreign militants from the restive North Waziristan region following the attack. Sindh police has released a sketch of the mastermind of the attack and also announced a head money of 1.5 million rupees, police said today. “The sketch was prepared with help of eye witnesses who saw the attackers and also with the assistance of a mobile shop owner in the interior town of Nawabshah,” police spokesman Imran Shaukat said. Some of the militants involved in the attack had allegedly gotten SIM cards from the shop in Nawabshah. “The arrests were made after probe based on a SIM card recovered from a killed attacker,” he said. The police official said he was not sure whether the mastermind was killed in North Waziristan as police and intelligence agencies were still investigating the attack. The attack caused a fragile peace process launched by government in January to crumble, and military launched the operation to eliminate the militants. So far over 400 rebels have been killed and thousands have been displaced. Security forces have cleared Miranshah — North Waziristan’s major town — of mines and militants.